I don't know exactly when this "Pet Dental Health" segment from The Martha Stewart Show first aired, but I vividly remember seeing it for the first time on television a few years ago, and being completely obsessed. 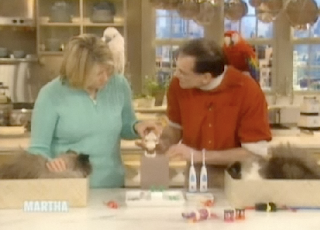 The premise is simple: Martha, and her favorite resident animal expert, Marc Morrone, both have exotic birds inexplicably perched on their shoulders while they give a demonstration on feline dental care. 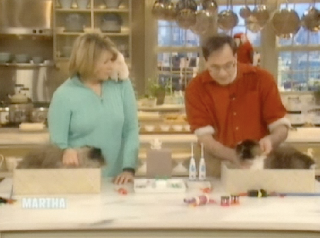 Martha's own cats, Bartok and Vivaldi, serve as their test/torture subjects. 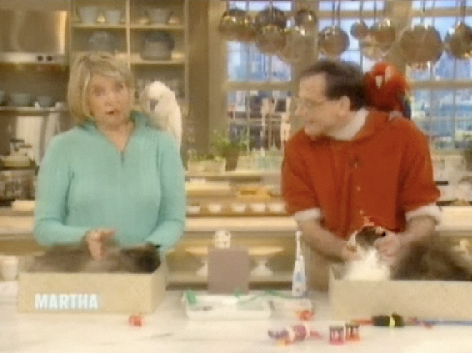 Dare I say, it is the best Martha Stewart cat video of all time. 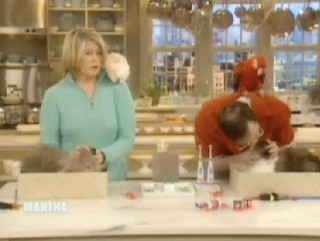 Martha on her cats: "They understand the value of clean teeth." Marc on Martha's assertion that her cats spend time outdoors: "Not everyone has a 6-foot stone wall around their property like you do." Marc on the condition of Bartok and Vivaldi's teeth: "Well, they're both senior citizens." Marc on how to tell if your cat needs their teeth cleaned: Check them. "These cats have sweet breath." 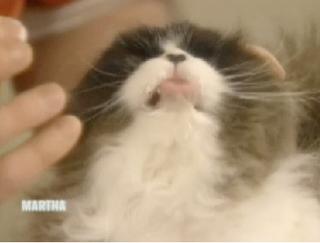 "Oh my cats have NO bad breath. Not allowed in my house." Marc demonstrates how "sometimes they'll paw at their mouths if they have a toothache." 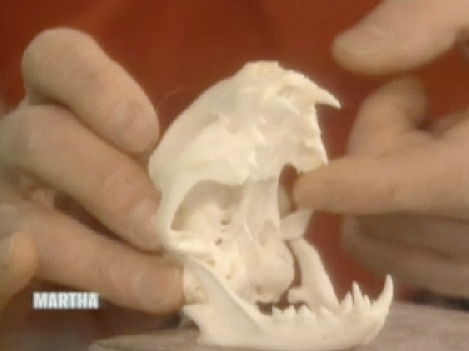 Bringing out the cat skull! Run, kitties, run! 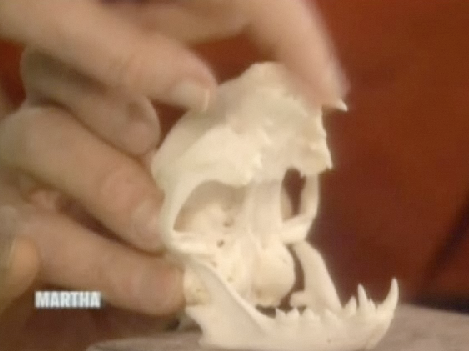 Martha: "Is that a real cat skull? 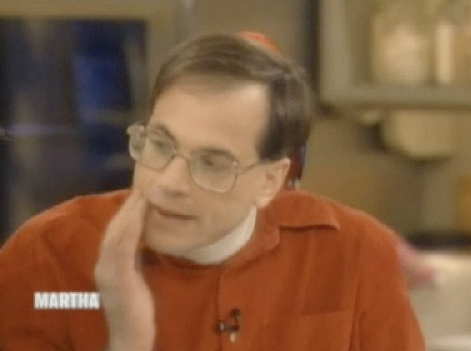 Marc: "Yeah, he had to be on Martha's show." 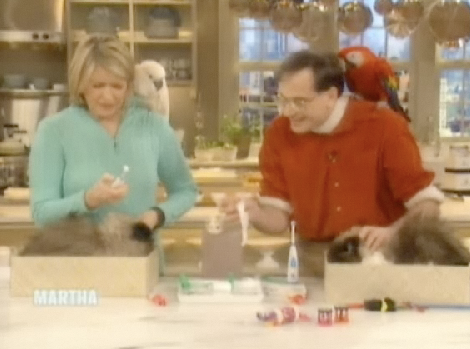 Martha: "Now these are called the canines." Marc: "Even though they're for a cat. Felines." "All this fur gets in the way!" 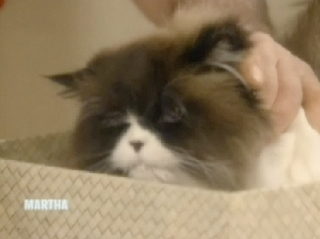 Martha: "Oh look, how nice! 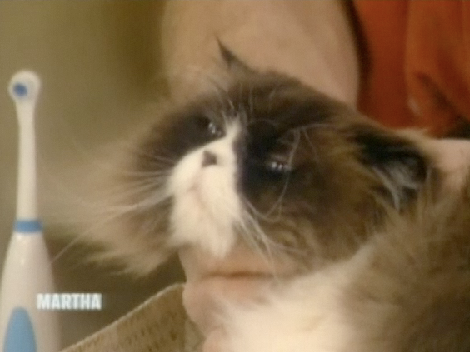 Marc: "Not all cats are as cooperative as yours." Martha: "Look, delish!" Paws up! 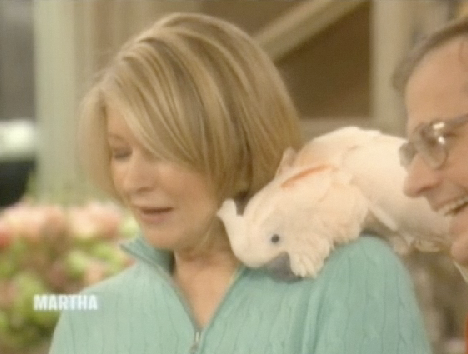 Martha: "Oh he likes it, look!" Marc: "Try some on your finger, it might be a little easier." 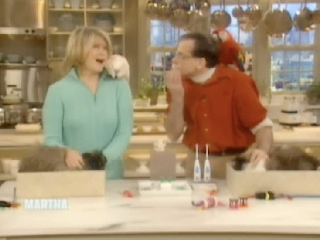 Martha: "I don't want my finger bitten." 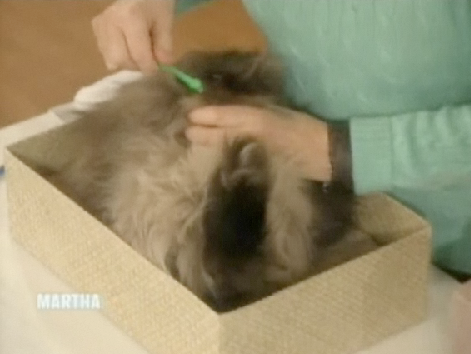 "We have to do your back teeth, beautiful Bartok!" "If the cat is disagreeable, just put some toothpaste on its nose." ".. and let him lick it off." "Oh, what about the little electric toothbrush?" "Ooooh, Look!" 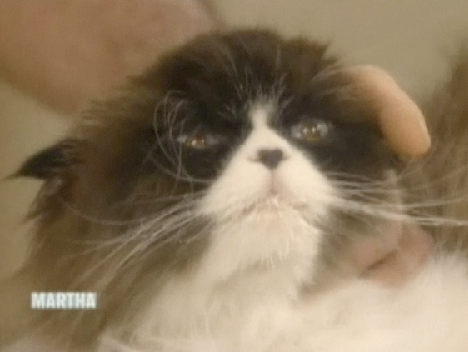 That cat just saw its life flash before its eyes. "He doesn't like the electric so much, oh no. Forget the electric!" Marc: "Another point, cut the cats nails before you start." 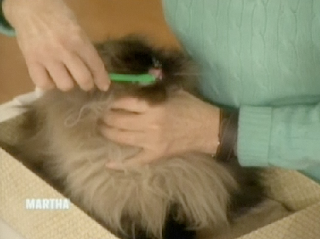 Martha on Marc's suggestion to brush the cat's teeth every day: "Every day! 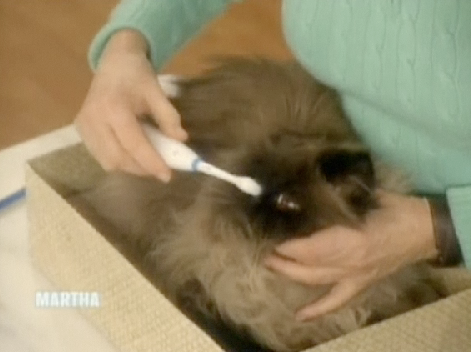 4 cats, 3 dogs, I will spend a good hour brushing teeth other than my own." Marc: "We're desensitizing the animals." 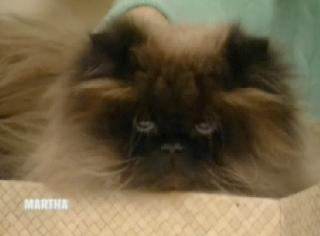 This is the face of Feline Post Traumatic Stress Disorder. 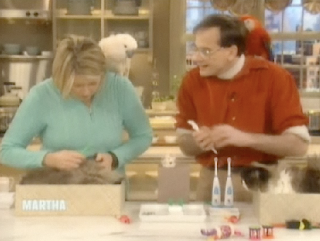 View the entire video in all its glory at MarthaStewart.com.